After the Dream Kpop Fantasy Concert last January 2013, I immediately wished for a solo Infinite concert here in the Philippines. If you are a fan of any group or singer, you will know that a 30 minute performance is not enough, it will never be. I even asked Ms. Happee Sy if she could organize another Infinite concert here...though I doubt Ms. Happee read that blog post. I guess I just wished it upon the stars and then somehow the universe heard me and granted my wish! 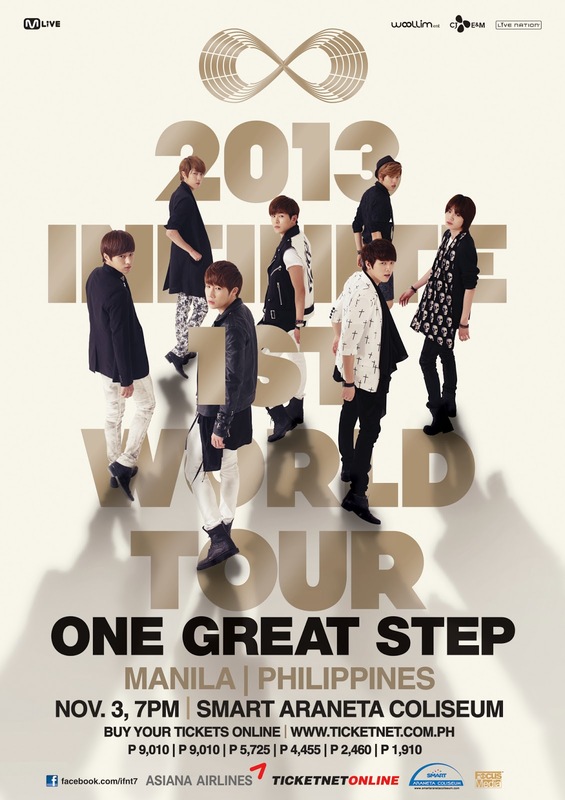 Here it is, only a few days to go before the Infinite One Great Step in Manila! If you're a fan of them, then you already know that Manila was not included in the first list of their concert destinations... Fans were devastated until this rumor went out : click here. Sunggyu apparently talked to a Filipina fan at the Incheon airport. When she asked Sunggyu if they were coming here, he apparently answered "....it's not announced yet." Now that everything is final and only a few more days before the big day, I'm happy to see Smart Araneta Coliseum doing their best as Inspirits in promoting the concert.. Here is the huge tarpaulin hanging on Araneta Coliseum's parking building in Cubao. See you at the concert! If you will go to the concert as well, leave a comment below so we can organize a quick meet up around the Smart Araneta Coliseum! 7PM at the Smart Araneta Coliseum. Tickets are available at Ticketnet.